Dr. Ben Carson, the retired chief of Neurosurgery at Johns Hopkins University Hospital, has experienced a meteoric rise in conservative political circles since he upstaged President Barack Obama with a speech at the National Prayer Breakfast in 2013. Carson’s mild mannered delivery of critiques of the Obama-nation coming from a faith filled physician with a compelling personal story stole the show. Carson’s remarks before the National Prayer Breakfast, as well as CPAC and the Faith and Freedom Coalition spawned a “Draft Ben Carson” campaign, which raised nearly $12 million in a year. The “Run Ben Run” movement played upon peoples’ enthusiasm for a thoughtful prospective politician’s candidacy, but the unaffiliated Super PAC had dubious spending patterns, rolling most of the garnered donations back into the fundraising operation. In early March 2015, Dr. Carson announced that he was forming an Exploratory Presidential Campaign Committee, which was all but a pro-forma announcement of a White House run. Since then, Dr. Carson has made numerous media appearances which has inspired increased scrutiny. Just after the Exploratory Committee announcement, Dr. Carson was drawn into a debate on CNN’s “New Day” with Chris Cuomo on whether homosexuality is a choice. 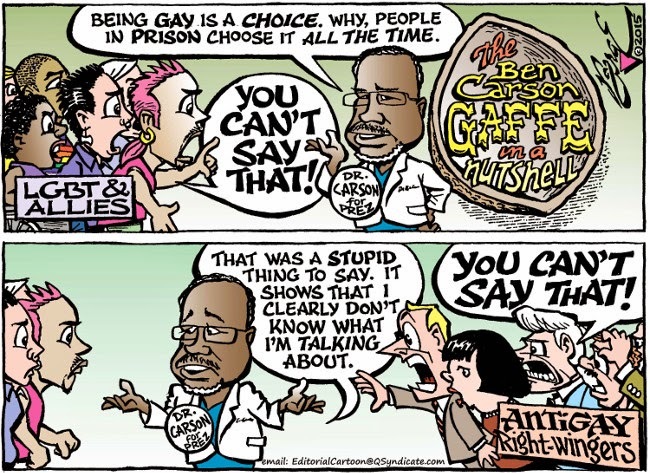 Carson commented that convicts "go into prison straight -- and when they come out, they're gay. So, did something happen while they were in there? Ask yourself that question," This view syncs with Dr. Carson’s Seventh Day Adventist background and traditional marriage premises but did little to advance his candidacy. Shortly afterwards, Carson backtracked on the statement saying "I realized that my choice of language does not reflect fully my heart on gay issues." Later, Carson declared that he would no longer speak about gay issues. But the damage had already been done. Glenn Beck called this quote “the dumbest thing I’ve every heard”, which led Beck to declare that Carson’s candidacy was over just as it begun. That may have been hyperbole, but it was unwise for Dr. Carson to touch today’s third rail of politics in a wonton way. Carson squandered his wider introduction to the public by allowing himself to be painted a bigot for a peripheral point. As part of the media barnstorming effort, Dr. Carson engaged in a thoughtful radio interview with Hugh Hewitt, a politically center right Salem Radio host who prides himself on not conducting ambush interviews. Since the 2016 Presidential Campaign cycle may well pivot on foreign policy issues, Hewitt asked about Russian provocations and Western response. When asked how NATO should respond if Putin made a move on the Baltic States would we go to war, Dr. Carson responded: “Well, if we have them involved in NATO. We need to convince them to get involved in NATO and strengthen NATO”. Hewitt later followed up on an inference that Carson did not seem aware that the Baltic States were part of NATO. Dr. Carson rejoined: “Well, when you were saying Baltic state, I thought you were continuing our conversation about the former components of the Soviet Union. Obviously, there’s only three Baltic states.” Unfortunately that clarification was as clear as mud as Latvia, Lithuania and Estonia were former components of the Soviet Union and have some ethnic Russian speaking communities still residing there (which was the pretext for Russia effectively seizing Crimea and try to take the Donbass). Hewitt is known for in-depth interviews and going into the proverbial weeds to explore military issues. Carson’s ignorant answers on defending our Baltic State NATO partners exposes a serious chink in his campaign armor and exhibited a lack a preparation. 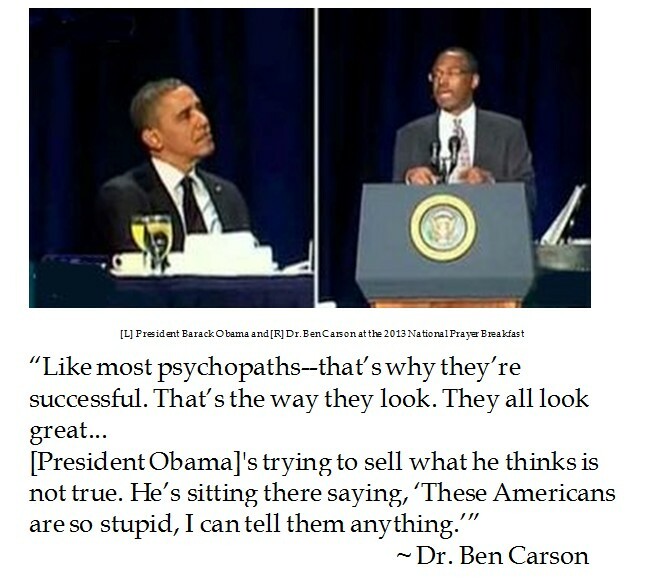 Dr. Carson is a renowned neurosurgeon, not a psychiatrist, so taking a swipe at President Obama as a psychopath is off the mark. Such a distant diagnosis from Charles Krauthammer (who was trained as a psychiatrist) seems reasonable, but from Dr. Carson it seems like a harsh characterization. Part of Carson’s political charm is his mild mannered air of authority. Being bombastic by characterizing the Obama obsession with optics and fooling “idiotic” Americans sacrifices this strength. Moreover, this pugilistic “psychopath” trope was nothing new and unlikely to garner much new support. Ben Carson has proudly declared: “I'm not a politician and that I never intend to become a politician. Even if I'm elected to office, I'm not going to be a politician because they tend to do things that are politically expedient. And I'm not trying to do things that are politically correct.” In this day and age, not being considered a Beltway Establishment politician is an advantage to base voters who tire of political lies and political correctness. However Dr. Carson is making plenty of rookie mistakes in on the political field. Allowing a Draft movement to exploit donations which never really make it to the actual campaign may dismay donors. Opining on hot button issues like homosexuality without successfully connecting it to preserving traditional marriage, which should really be an ancillary campaign issue in the first place. Taking partisan pot shots like labeling the incumbent a psychopath which mars his soft spoken demeanor and popular appeal. Giving extensive access to media outlets like CNN and GQ on the proto campaign roll out which would play gotcha journalism. Then there is the sin of going on friendly media like Hugh Hewitt unprepared, exposing a key weakness of the candidacy, namely foreign policy chops. Dr. Carson was no stranger to making controversial statements, such as his interview with conservative radio firebrand Mark Levin in which an animated Dr. Carson called white liberals the worst type of racists for putting blacks in a box. That perspective may be provocative and perspicacious as a pundit, but it sounds like another thing altogether on the campaign trail, especially with spin coming from other campaigns' opposition research laundered through the compliant press. As Dr. Carson continues to move closer to declaring his candidacy for the Republican Presidential nomination, he has come out swinging for the fences. Unfortunately, he seems to be off balance for some of the pitches and creating lots of wind. To mix sports analogies, the off balance stance on the campaign hustings makes him prone for sucker punches from the Lamestream Media. Dr. Carson could make great contributions to shaping the campaign conversation in the 2016 Cycle. His tremendous personal story shatters the liberal labeling of Republicans as the party for old white men. Dr. Carson’s faith history underscores a potential appeal to evangelical voters, which would be key to victory in the Iowa Caucuses. As a physician, he would be given great credence for critiquing Obamacare. So Dr. Carson should eschew some of his ardor against being a politician and get good advice which best represents his brand as a thoughtful outsider who will not abandon promises because it is politically expedient. As Senator Ted Cruz (R-TX) was barnstorming the mainstream media before the presumed Republican presidential candidate makes his intentions official, he spoke about Climate Change on Late Night with Seth Myers. The Lamestream Media would love to paint Senator Cruz as one who sets the world on fire, not just from misunderstood political metaphors but also due to partisan politics on the environment. Ardent environmentalist Governor Jerry Brown (D-CA) used his appearance on Meet the Press as a forum to besmirch Senator Cruz as being unfit for office due to a green global leadership test. Although this is Jerry Brown's fourth term as Governor of California, long time political observers can recall how Governor Moonbeam hesitated in taking prevailing scientific wisdom in eradicating the Mediterranean fruit fly in 1981, which compounded problems. Lest anyone believe that Jerry Brown was virtuously standing up for green health concerns, when he ran for governor in 2010, Brown quipped: "If I see a Medfly, I'm going to spray that sucker. I'm not waiting this time." Notwithstanding Governor Moonbeam's scientific shilly shallying on the Medfly, Brown backs his bluster against a Tea Party bete noir with the 90% scientific consensus statistic. Well, at least Brown did not use the Al Gore settled science canard. 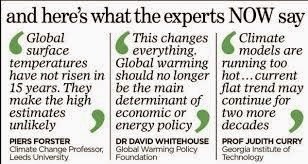 Wonder if how much of this consensus was based on the falsified East Anglia hockey stick model. Then there is the temptation for climate scientists can to claim "the sky is falling" for more money to study the issue. 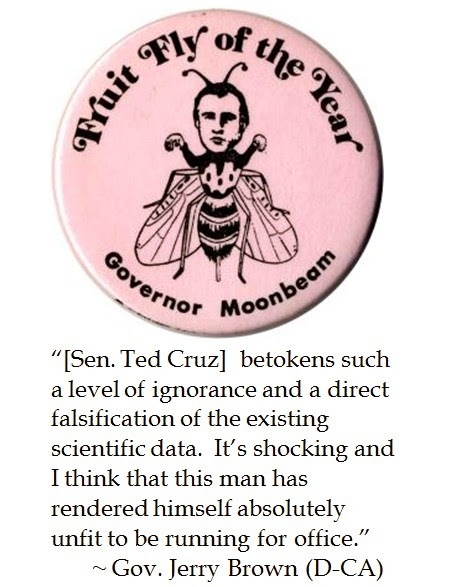 Senator Cruz noted that satellite data over the last 17 years has not shown any increase in temperatures. What have leading climate scientists had to say about this mercurial anomaly? Governor Moonbeam's Green Global test seems little more than a progressive popularity contest and paint your political opponents as ignorant knuckle draggers. As Governor Brown admitted on Meet the Press, he would have run for President (again) if he were only 10 years younger. But he probably would have run as a watermelon candidate-- green on the outside and red on the inside. At this point of the 2016 Presidential election cycle, most prospective Presidential nominees are playing coy about their intentions to run for the White House. Many media personalities will jocularly try to get a story by coaxing the candidate to declare his or her intentions on the air. Serious candidates need to sound interested to prospective supporters, yet not proverbially put the cart before the horse by declaring not at a time and place of their own choosing. So Glenn Beck's exchange with Senator Ted Cruz (R-TX) at the end of a lengthy radio interview included the obligatory "ask". However, the junior senator from Texas gave a memorable deflection. When some politicians claim quote their children, it sounds as if the kids were cued off of a teleprompter. An infamous example was President Jimmy Carter's alleged exchange with daughter Amy about the dangers of nuclear war during a 1980 debate with Ronald Reagan. The quote from Caroline Cruz certainly sounds like a six year old's logic. While the quip intimated that the family blesses Senator Cruz intention to throw his hat in the ring, it also served as a light hearted feint to the question of declaring. Running for President is a grueling effort to constantly travel, raise funds, react to opposition in real time and try to project a positive prospective policy. 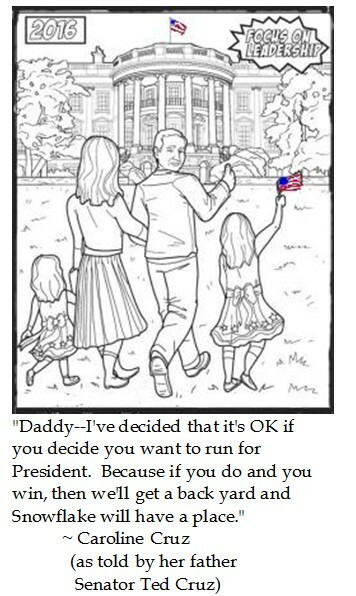 Many politicians refrain from continued combat in the political arena to supposedly spend more time with family. It is a twist to conventional logic to a family to encourage a campaign to gain a back yard for a dog. Yes Caroline, there is more than a Snowflake's chance in Texas that Ted Cruz is running for the White House. But now was not the time to color in that picture and say it with surety. Is Common Core a Co-Creation of Political Correctness and Crony Capitalism? 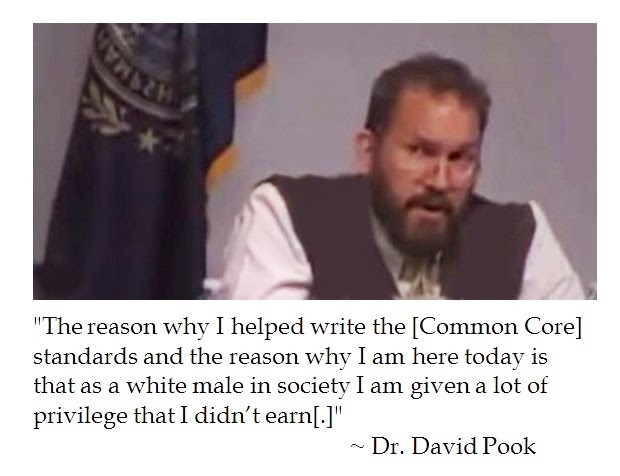 During a forum held by the New Hampshire Institute of Politics at Saint Anselm College, Granite State professor Dr. David Pook offered that he helped craft the Common Core Standards for English Language Arts because of "white privilege". Ironically, the Derryfield School in Manchester, New Hampshire (which has a 91% Caucasian student body) where Pook serves as chair of the History Department, does not use those Common Core standards because they are inferior. So why do some politicians continue to champion Common Core? Some have suggested crony capitalism. Former Florida Governor Jeb Bush (R-FL) is a big backer of Common Core. Kathleen Jasper, a former Florida educator and founder of ConversationED.com, suggest that there may be pecuniary interests in pushing Common Core. 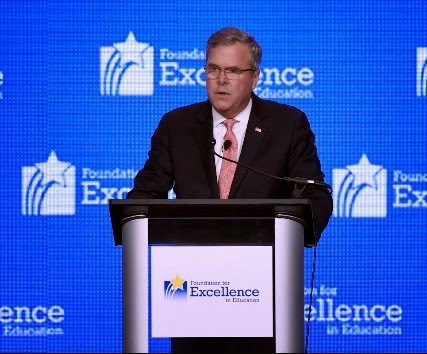 Jeb Bush's Foundation for Excellence in Education is heavily tied to Pearson, a leading education publisher and test making company. So Pearsons publishes the k-12 books, they create the tests, they score the tests and coincidentally keep the data. Per Jasper, Pearson garners between $15-$30 for each test administered. Due to No Child Left Behind and Race For the Top federal mandates, students have to retake the tests over and over again until they achieve an acceptable score. So kids keep constantly taking tests (without knowing why they failed) and businesses like Pearson profit from processing the perpetual paperwork. Presuming this is an accurate assessment, it is ironic to see how Educrat's political correctness works well with crony capitalism in Common Core which imposes a regime which profits from failure to educate well. Rep. Trey Gowdy (R-SC 4th), the Chairman of the House Select Committee on Benghazi, responded to the Hillary E-Mail controversy on CBS's Face The Nation. 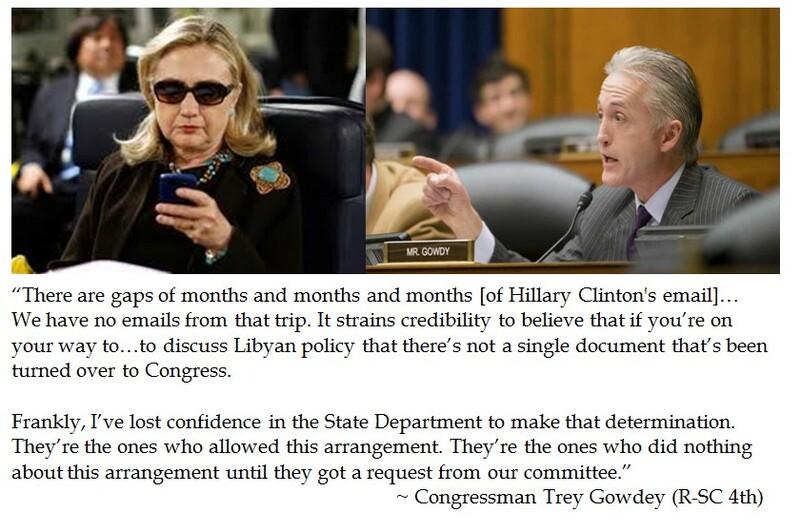 Some cynics wonder why Chairman Gowdy is now in the forefront about Hillary's sui generis e-mails while heading the State Department, as the Select Committee had knowledge of this practice going back to last summer. Gowdy is a former federal prosecutor so he is patiently building a case and did not want Ms. Clinton to testify before he had all of the information vetted. While a litigator in an Article III court wants all relevant information, such a broad request could be framed as a witch hunt or a fishing expedition in the political realm. So now that there is sufficient public pressure, the former Secretary of State may feel compelled (for continued electoral viability) to "step up" and completely surrender the cyber records and not just feign compliance. Chairman Gowdy, who first came to office as part of the 2010 Tea Party wave elections, may distinguish himself between the bluster and the brashness of the District of Calamity by building a compelling case to discern what happened in the Benghazi bungle of September 11, 2012. But if Gowdy fails to impressively interrogate the former chief of Foggy Bottom, conservative cynics may echo Hillary's last Congressional testimony--"What difference, at this point, does it make?" Combined with Speaker Boehner's capitulation on DHS funding with a rider excluding Executive Amnesty (which lost 167 Republican votes on final passage), conservatives might wonder if having friends like that in high office whether they need enemies. Former Secretary of State Clinton claimed that we should strive to figure out why the Benghazi bungle happened. Could it be due to insecure communications from hdr22@clintonemail.com (or mau-suit@clintonemail.com)? Or a pattern in the Obama Administration to use backdoor, off official communications, to convey inconvenient truths? It does not seem that it was just Hillary Clinton and Eric Holder, as we should not forget the pseudonym Richard Windsor (a.k.a. EPA chief Lisa Jackson ). So much for the Obama Administration being the most transparent regime ever, as they took their anti-secrecy award in 2011 in a closed door presentation.